Migration of mailboxes and mailbox items form Lotus Notes to Outlook is necessary when an organization moves from Domino environment to Exchange environment or when its employees have to access Lotus Notes mailboxes and items from Outlook. Microsoft Transporter Suite for Lotus Domino is a Microsoft tool that can be used in such situations. Third party tools like NSF to PST are extremely helpful for successful NSF to PST migration, for almost all versions of Lotus Domino and MS Outlook. 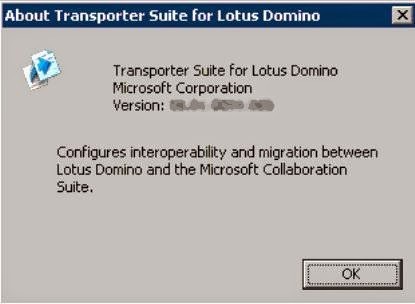 Microsoft Transporter Suite for Lotus Domino is a set of interoperability and migration tools that facilitates migration from Lotus Domino to Exchange Server. It achieves directory, Free/Busy interoperability between Lotus Domino 5, 6, 7 or 8 and Active Directory or Exchange Server 2007, and migrates users, groups, personal address lists, mailboxes, personal mail archives, and applications form Lotus Domino 5, 6, 7 or 8 to Active Directory or Exchange Server 2007. Microsoft Transporter Suite for Lotus Domino (Transpoerter.msi /Transporter32.msi) is a free tool from Microsoft and can be downloaded from its download center after checking the system requirements. Migration of Users, Groups, Mailboxes and Applications is performed using the Migrate option of the Transporter for Lotus Domino Management Console. Upon selecting this option on the left pane, all available users, groups, mailboxes or applications gets displayed in the middle pane. For e.g., when the option mailboxes is selected on the left pane, all mailboxes are displayed on the middle pane. Now you can migrate these mailboxes just by selecting the Migrate Selected Mailbox(es) option on the right pane and then following the on screen instructions. Please not that for successful migration, the active directory should have an equivalent that matches with that in the Domino directory (When you migrate the mailbox of a user, a matching user account should be there in the Active Directory). Note: For migration, you need to have the Lotus Notes client installed on the system. In addition, you need to have proper permissions. Kernel for NSF to PST a Notes to Outlook email migration tool that helps system administrators, IT technicians and individual users to move emails, attachments, contacts, notes, journals, calender items etc., from IBM Notes to MS Outlook easily and accurately in no time. Unlike many other tools, Kernel for NSF to PST supports almost all versions of IBM Lotus Notes, MS Outlook and Exchange Server. NSF to PST Converter is the best solution for those user who want to migrate NSF file to Outlook PST format. The tool provide many advanced features that provide quick and safe method to perform the conversion process. I would to recommend you with another solution named NSF to PST Converter Online Software. This tool smoothly converts every Lotus Notes database from NSF files to Outlook PST files with more ease. If you want to convert your Lotus Notes NSF emails to MS Outlook, you can easily do it by using manual techniques. This technique provides easy manual steps that can effectively export all Lotus Notes emails and attachments to Outlook format. See more info at:- NSF to PST Converter. NSF to PST conversion or Lotus Notes to Outlook migration is easy with eSoftTools NSF to PST converter software which is compatible with all versions of IBM Lotus Notes server. It can convert NSF files into various forms which is easily readable by user's machine. It available with free version. Read more ways to convert NSF files to PST files here.